Scud, pupa, 1x strong, 1x short. Sizes 6-22 in quantities of 50. 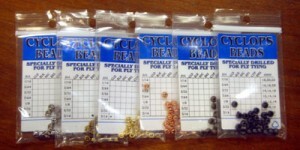 Standard fly tying beads in several colors from the normal black to more subtle colors such as brass and brown-olive. Colors available: Gold, Brass, Copper, Brown-olive, Nickel and Black. 7 sizes available. 24 per pack. A phenomenal spiky dubbing used for nymphs. Tough to find a better nymph dubbing on the market. Comes in a variety of shades and colors.